Every Vernon Adams story in 2015 is required to marvel at the irony of his Week 1 matchup, so let’s do that up front. Adams took over at quarterback for Eastern Washington, an FCS school, in 2012. In one of his first starts, against archrival Montana, he rebounded from two fourth-quarter turnovers to win with two touchdowns in the final four minutes. The rest of his career has been similarly charmed. He finished as a runner-up for the past two Walter Payton Awards — the FCS player of the year — and helped the Eagles beat a top-25 team when he put 500 yards and six touchdowns on Oregon State in 2013. This winter, he decided to forego his final year in Cheney, Washington, and travel to Eugene, Oregon, as a graduate student. He’ll start for Oregon this year. His first game is … (here it is) … this Saturday against Eastern Washington. But Game 2 is on the road against no. 5 Michigan State. And THAT is when this gets fun. I honestly feel like this would be a bigger story if it were happening somewhere else. Imagine Adams at Alabama and all the attendant anxiety that would inspire. Or put him at Michigan with Jim Harbaugh this year. It would be impossible to talk about anything else. 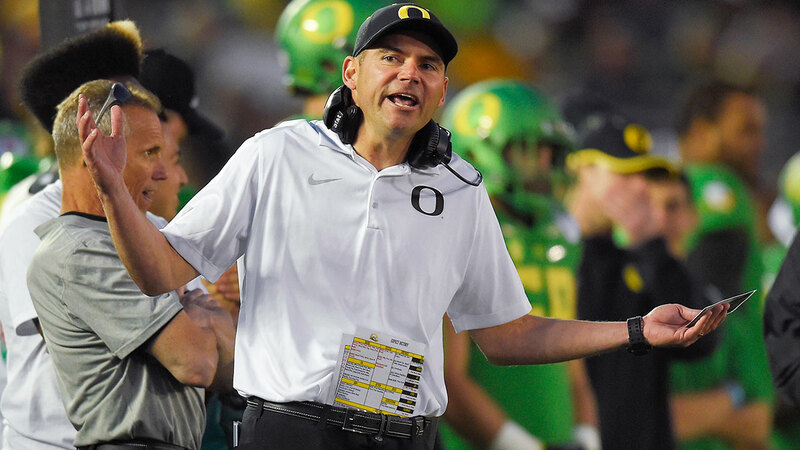 Consider the offense Oregon has put together for the past decade and it feels like it doesn’t matter that Mark Helfrich is replacing the most successful quarterback the program’s ever seen with an FCS player. Success is a given at this point. To some degree, the evidence supports this: Before Marcus Mariota, guys like Dennis Dixon, Darron Thomas, and Jeremiah Masoli managed to make this offense look great. Maybe that’s how this will go. Mark J. Terrill/AP Photo Oregon head coach Mark Helfrich. Either way, East Lansing is looming. Once the novelty of Week 1 wears off, this gets real pretty quick, and it’ll be fascinating to watch. How many times do you see a player tearing through the FCS and wonder whether why he couldn’t do that in the SEC? Let’s consider four ways this can play out. Oregon has finished in the top five in four of the past five seasons. It hasn’t been ranked lower than 11th since 2007. Maybe it’s the relatively muted personality of the head coach, the uniforms, or Nike’s ability to make this program feel like a really dope Wieden + Kennedy commercial for college football, but it seems like we forget to treat this team like the traditional powerhouse it’s become. For Adams’s purposes, all the past Oregon success that supposedly makes him a sure thing also means that he has to be very, very good just to be considered acceptable. Players like Vernon Adams have ushered in a discussion of “college football free agency” and what it all means for the future, but we’re not quite getting the full picture. This trend became popular after Russell Wilson left NC State to lead Wisconsin to a Rose Bowl, and it’s continuing this year with Greyson Lambert at Georgia, Everett Golson at Florida State, and Adams at Oregon. It may well be a new model for how this sport will operate. But as everyone wonders what that means, it’s important to remember that most of these experiments won’t work. It’s not easy to walk into a new offense, with new teammates, and transition seamlessly. Wilson was so much better than anyone realized when he went to Wisconsin, and everything clicked immediately, but that will almost certainly be more exception than rule for these situations. If Adams struggles early, he’ll probably be benched, and this whole year would go to waste. Even if he continues playing and Oregon goes, say, 9-4 instead of 11-2, that’s a significant step back for the Ducks. This is the curse that comes with the gift of walking onto a top-five team and becoming the starter after two weeks. This is obviously the most depressing option on the board, but it has to be mentioned. Adams is listed at 6 feet, 200 pounds, which means he’s probably closer to 5-foot-10, 190. The reason smaller kids don’t get recruited out of high school isn’t strictly skill-related. Some players aren’t quite big enough, or fast enough, to survive playing major college football. Even Mariota played large chunks of last season battling nagging injuries. Adams broke his foot and missed four games for Eastern Washington. If something along those lines happens this season, this whole story could be derailed before it ever really gets going. The most likely scenario. Oregon plugs Adams into the machine and he keeps it all running. They score, they outrun everyone, and it looks like most of the other Ducks teams we’ve seen in the 21st century. Oregon loses on the road at Michigan State, and maybe drops a game at Stanford, before bowing out on New Year’s Day and finishing somewhere in the bottom half of the top 10. Nobody would call this a disaster, but it wouldn’t quite be a triumph, either. It’s just what happens when a team loses a Heisman-winning quarterback. The whole thing goes DEFCON: SPORTS MOVIE. Four years ago, Adams was in his hometown of Pasadena, sitting in the Rose Bowl stands, watching Wilson and Wisconsin but cheering for his favorite offense. Bralon Addison is a junior receiver who’s back after missing all of last season. Darren Carrington will be back after a suspension cost him a spot in the national title game. Byron Marshall is a converted running back now playing receiver, and he could wreak havoc any number of ways. Pharaoh Brown is a tight end who could be dominant if he can recover from last year’s horrifying leg injury. Royce Freeman was explosive as a freshman running back last year, and should be even more dangerous in Year 2. The pieces are there to blow people off the field. If Adams comes in from the FCS and pulls it all together at the highest college level, doesn’t that make him as impressive as any player in the country? And given the success he’s had in the past, is it really that ridiculous to think he could be even better surrounded by stars? It’s on the table. There’s a popular theory about what’s possible in Eugene this season. Of course, it’s equally possible that the buzz this month — and articles like this — marks the high point of this year at Oregon. Did you hear who Oregon plays this weekend? This post has been updated to correct Eastern Washington’s mascot.